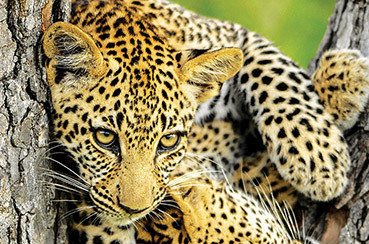 Leopard Mountain Safari Lodge Reveals Its Upgrade! Born and bred in Durban, Phumy has always been a hard worker. Her father taught her from a young age to always step out of her comfort zone, hence she has constantly strived for the best and has always found her own unique approach when faced with situations. She likes to see light in any problem that arises and believes a good laugh and a positive attitude can help her get through anything. She is at her best when she’s in her treatment room making her clients feel and look great from the inside out. With her sociable, caring nature she has become a valued member of the Leopard Mountain team and runs an exceptional spa to boot! We chat to Phumy and find out what, how, when and why she discovered her passion for beauty in the Bush……. What do you do at Leopard Mountain? I started as a spa therapist and after a year was promoted to a Spa Manager. I also host and assist in other aspects of the lodge; we are like a big family here at the lodge so we all help out where ever we can to make our guests stay an exceptional one. Why Somatology and why the Safari industry? During my matric year, a group of friends and I decided to visit different universities to learn more about the different courses offered. I was drawn to the skin therapy section of Somatology and immediately fell in love with skin care therapy. It was right there and then my Somatology Journey began. While studying, I worked as a part time therapist at a salon in Durban; it was a colleague of mine who had worked at a Safari Lodge who told me more about the Safari Industry – needless to say my interest was piqued. I completed my studies, progressed and worked at several spas in Durban and other lodges, in 2015 I applied for a Job at Leopard Mountain and I haven’t looked back since. What made me choose LM and what keeps you here? After working for one and a half year at my previous work place, I planned to relocate to Mpumalanga. I just wanted a change of scenery as I have been in KZN my whole life. It was my agent who recommended Leopard Mountain (LM) and although my plan was to relocate, I found myself hooked by the beauty of Zululand Rhino Reserve. My agent then organised a meeting and within a blink of an eye I was one of LM’s employees. I grabbed the opportunity with both hands! LM is constantly busy, each day brings about a new challenge, and your mind is constantly working, thinking and strategising. One needs to be constantly on the ball. Rolling the ball is not always easy, however if you focus, you will reach your goal whether it’s providing the best service, reaching targets or simply just doing an outstanding Job. Reaching goals result in mental growth which is what I have achieved at LM. During your tenure what have been your interesting and adventurous experiences at the lodge or on a game drive? I have never realized how much wildlife can impact a person emotionally. My first game drive at LM, we saw a lioness feeding on a Giraffe (which might I add are my most favourite animal). I absolutely enjoyed the sighting but then my favourite animal was killed ….. This was a bitter sweet moment for me to say the least. When on safari at Leopard Mountain your schedule is pretty chock ‘n block why should guests take time out to have a spa experience? We are living hectic lives, one of the main reasons people go on vacations is because they want to de-stress. The long hours travelling, long drives, long flight hours, climate change from one country to another, one city to the other and medications taken before travelling. All these factors result to a tensed and stressed body where 80% of the time we do not realise it. We need to think of our bodies like how we think of nature. If you take care of nature it will take care of you in return, same applies to our bodies, if we take of them, they will take care of us. Being in the bush is a harmonious experience; however a stressed body may not be in complete harmony. We need to reconnect with ourselves as much as we connect with nature. It’s amazing how much our treatments with the aid of our products can bring about ultimate tranquillity in one’s life and holiday. Leopard Mountain’s guests should absolutely get treated, we do not “pamper” as such. We are result orientated, we are wellness orientated. We spoil you in a therapeutic way. 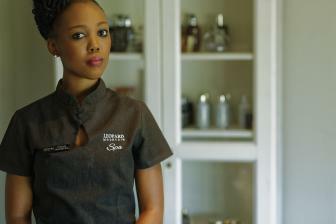 How can someone book a spa treatment when visiting the lodge? And what treatment do you recommend? That’s very easy, email us or call us directly. Every treatment serves its own purpose; every treatment is enjoyable in its own way. I recommend treatments according to the needs of your body. Before we start a treatment, guests are requested to fill out a consultation form. This form assists me into reading your body and its needs. I then decide on the product and advise guests as to what I recommend and why I recommend it.